This is my first post since returning to work after a family holiday. It is not a post about my holidays in Blackpool, as no-one is really interested in another person’s holiday – admit it we only care about our own! It is rather some thoughts on our experiences as customers of various services providers during our holiday. I have a strong interest in Services Marketing and like the idea of ‘moments of truth’ from the Jan Carlzon book of the same name. Everyone is a Customer. Most likely everyone is a customer several times a day. Single people, students, parents, grandparents and children, we are all customers. As a service provider, I think it is important to think about how one treats customers. I have a particular interest in how service providers treat customers and I think you can learn from other service providers in how they treat you when you are their customer. We left the house at 10.30 am for the 2.30 PM Irish Ferries sailing from Dublin Port to Holyhead. We decided to go down the Quays and ended up being late as traffic was very heavy due to the bus strike. You are supposed to check in 30 minutes before departure. We checked in at 2.10PM – no hassle whatsoever from the Irish Ferry staff. I think we were the 2nd last car onto the ferry. We had no delay which was great. This was my first time driving onto the ferry and we soon realised that the downside of being late is that all the seats were gone. Which brings me to the Irish Ferries moment. The staff saw that we had two very young kids and that standing for 2 hours would not be much fun. They ‘engineered’ a table for us by asking some people to move to other unoccupied seats. It was very much appreciated. We will know for again to plan to be early. And yes we will be traveling with Irish Ferries again. My wife selected Blackpool as our two kids are Dora crazy. She lives in Blackpool you know. The highlight of the summer has been the anticipation of meeting Dora in Nickelodeon Land in Pleasure Beach. We spent most of Wednesday there. The most striking thing is the scale of Pleasure Beach. 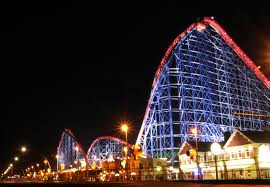 The Big One Rollercoaster (pictured) is some feat of engineering and signs proudly inform visitors that it is celebrating 90 years in a few weeks time. What an investment and what vision by whoever takes the credit. It is certainly a magnet for crowds. Our eldest is 3 and a half and she loved meeting (getting picture taken) with Boots and later Dora and then Diego. There is a Dora attraction which is not particularly exciting – a boatride in a gondola type boat for a few minutes. There must be massive potential to do something really wondrous with all the Dora adventures. Overall, Pleasure Beach was worth the day – we did all the age relevant rides and everyone was wrecked at the end of the day. That evening I searched online on my iPad for more things to do in Blackpool. We were staying for 5 nights and would not go back to Pleasure Beach again (this week no but in a few years yes) even if it was free (about £80 for us for full day with hotel discount). There is loads to do including a visit to Stanley Park which is a fantastic Park about 2 miles outside town. The reviews on Trip Advisor were very helpful. It is a treasure of a spot. We spent all day there. Parking was free at the side of the road (literally hundreds of cars) – there would be no such free parking in Ireland. We had a lovely walk in the park, down by the lake (paddle boats available for hire), into the Italian garden, past the bowling greens, a nice stop in the wonderful Cafe, then over to the fantastic playground, a quick spin on the trampoline and bouncey castle and then a lovely surprise. Thomas and Percy are favourite toys in our house. 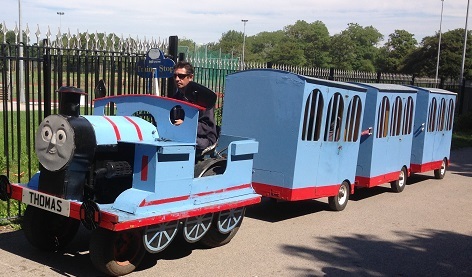 There is a lovely ‘Choo Choo’ named Thomas who does a ten minute trip around part of the park for a few pounds each. After a relaxing morning and afternoon, we headed back to town so that we could spend an hour on the Beach – a bit chilly but sure we are on holidays! We decided to stay beside Pleasure Beach in The Big Blue Hotel. Again Trip Advisor was a big factor in the choice. It is a lovely hotel beside the fantastic promenade. The room was lovely. It was no bigger than a standard hotel room but the design was great. Our daughter was delighted when she saw her ‘room’. It was a bunk bed just inside the door with two small tvs and a little closet for her clothes. It was somewhat segregated from the main room as the en suite was next to it. It had loads of open shelf space (as opposed to drawers) which I like in a hotel. The staff in the hotel were really great. One ‘moment’ was a particularly memorable deed. Firstly, i must explain that the only ‘minor issue’ with the hotel was that there were only two very small elevators in the hotel and one was broken for the entire time of our stay (how long does it take to fix an elevator?). But it did not really matter as we were only one flight up. We only really needed it if we brought the double buggy. One evening, we arrived back at the hotel after one of our long days with our double buggy with two kids in tow. One of the staff (young guy with big hair) was standing waiting at the elevator with a big tray of room service with hot food. When he saw us, he said something like ‘Take the elevator, I was just being lazy, I will take the stairs as only going up one flight. You can pretend I called it for you’. Really nice touch! The other design element that I liked about the hotel was the carpark system. There was no barrier at entry. You drove over some small barriers that then popped up so that you could not exit that way. There was a sign to say that if you wanted to exit, you needed to get a code from reception to lift the exit barrier. I really don’t like being issued with tickets every single time I go into a carpark. We went to Blackpool Zoo on the Friday. It is well worth a trip and compares very favorably with Dublin. There was a very nice play centre beside it also which the kids enjoyed. So we were heading for the hotel around 5PM and looking for dinner (I was learning that routine for mealtimes is even more important on holidays). My view is that it is best to stay out of the tourism hub and try to find someplace popular with locals, particularly when we have a car. In Ambrosini’s Italian Restaurant we found such a treasure. The food was amazing and the proprietor (he acted like the owner) was fantastic. He explained to us that the restaurant was small (we could see that) and that there were two sittings at 5PM and 8PM. The restaurant was fully booked from 6.30PM and we could only have the table till 6.20PM. This suited us perfectly as fast service when accompanied by kids is very much appreciated. What struck me was how he answered the phone. Bookings were flying in and he explained carefully to everyone about the times for the sittings and how they did not take deposits so if a booking was not going to be fulfilled that a call to cancel would be very much appreciated. He was a real character that you could not but like. The place is number 1 on TripAdvisor – did I mention that the food was fantastic. And the value was phenomenal. The cost for two main adult courses and pasta for the two kids was under £25. Talking about value, I was surprised that Nickelodeon Land did not have a great shop. There was a lot of the standard Dora stuff and even then some items were sold out (we did get a lovely Dora umbrella which is needed today at home). But where there is a gap there is an opportunity. We went around the town for a few hours on Saturday. The Shoe Supermarket on one of the main streets was aptly named. We bought Dora Wellies and Dora Flipflops and lots of other footwear all at extremely reasonable prices. At another shop we bought an inflatable Dora doll for £3 which is an extremely prized possession! I remembered to charge the battery for my very nice Sony digital camera before our departure. I need not have bothered. It was never used. It is the sign of the times that all the photos were taken with the iPhone. My wife got loads of photos printed out in the local Pharmacy yesterday – if we had not done it yesterday they may never have got printed – and they are fantastic! Hope you enjoyed my reflections on our family holiday. Looking forward to the next one already as it is important to take a break for your personal well being and health. But get back to work now!